This will quickly explain how to use bzr trough a HTTP proxy with authentication. We want to branch AND push. This requires the plugin bzr-plugins. Copy it to C:\Program Files (x86)\Bazaar\plugins or wherever you installed bazaar, and rename it to webdav. >copy webdav "c:\Program Files (x86)\Bazaar\plugins"
An http transport, using webdav to allow pushing. Pushed up to revision 7. Follow the link at https://launchpad.net/~bzr/+archive/daily to get the signing key: http://keyserver.ubuntu.com/pks/lookup?op=get&search=0xD702BF6B8C6C1EFD and save it to a file. 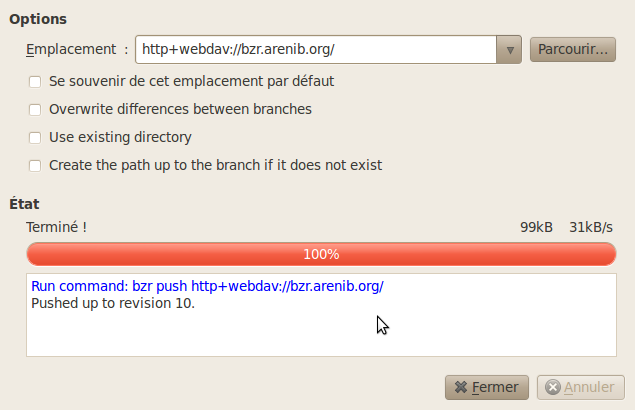 Install bzr-webdav using the new repository (this will also fetch the latest version of bzr and bzrlib). Pushed up to revision 9.